The roof offers us a vital layer of protection from the outside environment. It holds off the harshest weather to protect both the contents and our selves. It also provides insulation, keeping the temperature inside stable and reducing our heating needs. A roof is covered on the outside with tiles or slates, stacked in an overlapping fashion. This prevents seals from stacking on top of each other and allowing water to leak through. They are stacked in rows and are secured to the battens spread across the roof structure. Battens are nailed directly to the rafters that help hold the structure of the house together. Roofing felt that is laid underneath the battens forms a dust and water vapour barrier. It prevents the warm air within the roof from coming into contact with cold air under the tiles, therefore reducing the chance of condensation. It also prevents dust from being blown under the tiles and into the house. Please read below for more information and costs to expect. Ridge – Where the two opposing angles of tiles or slates meet you have a ridge. At this highest point of the roof it will be capped using ridge tiles. Valley – On the downward part of the slope where two sections meet, it forms a “V” called a valley. Hips – Where two sections come together at the top of the roof it forms a line called a hip. Flashing – A seal between the roof tiles and the building structure (brickwork), often using lead. Verges – Above the gables where the roof edge is exposed. Eaves – The overhang where the roof protrudes past the walls of the house. Facia Board – A board that runs along the roof at the lowest point, usually supporting the guttering. How Long Does a Roof Last On Average? Most will have a tough life holding off the notorious British weather and temperature swings. With this in mind you should understand the roofing materials shall naturally age over time. However the tiles, flashing and mortar on the roof receives increased stress during high winds, hard rain, heavy snow and penetrating frost. With manufactured tiles the typical lifetime expectancy is around 20 years. At this age the roof’s ability to hold out the elements starts to decline. Welsh Cottages and other buildings that have slate roofs can expect far greater working lives. Whilst 50+ years is expected many welsh cottages have stood their ground for over 150 years! So What Causes a Roof to Leak? Damp patches on the ceiling and stained plaster up high are dead giveaways. Once a leak is visible within your house it can be frustrating and expensive to trace and rectify all the damage caused along the way. A leak usually begins as water finds it way through a broken slate or tile, flows down the felt and finds a small sag in the material. The water collects and makes the sag swells until it drips through a breach. Going up and fixing roof tiles involves working at height, it demands extreme caution. It’s well worth having a professional tradesman complete the job on your behalf if you don’t feel confident. Roof repair cost is going to be covered in detail further on. The first item you should grab if you believe your roof is leaking is your binoculars. Scan the roof for damage as indicated above. You may be able to locate the problem from the ground and minimise your time scouting the roof. If it’s time for an entire roof replacement you should almost certainly be calling in a qualified roofer, unless you’re in the trade yourself. Scaffolding and a team of roofers will be required to get it done in good time. Now let’s discuss the common problem areas and how to fix roof tiles. A mighty storm can cause damage to all the tiles on your roof. Cracked, missing or dislodged tiles will need to be carefully replaced. 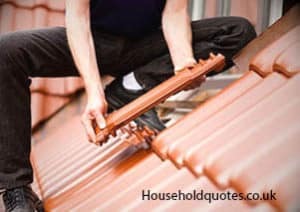 How to remove roof tiles: First lift up the next overlapping tile. This then begins to lift tiles on the row above. How to replace roof tiles: Lift a tile on the row above from the bottom and then slide your new tile into place. If your ridge tiles have been displaced they will need repointing. If the mortar is in good shape you may be able to simply adjust them. But if it has been completely dislodged you will need to replace the mortar and re-set the tile. Over time the roofs internal structure, timbers and trusses can warp. The movement of these members puts increased pressure on the walls and chimneystack. Eventually, it will crack through the mortar used at the joins. Once rainwater enters these joins the freezing/thawing breaks these joins further apart. The chimneystack lead flashing is the most vulnerable to this kind of damage. If gaps have emerged in the flashing it will need to be repointed. You will need to scrape out the bad mortar and use new mortar to seal the breach. If mortar crumbles and tiles become dislodged around the roof valley it will soon allow water in through the roof. Build-up in the valley will cause rainwater to rise underneath the tiles and through into the loft space. Internal roof timbers can begin to absorb water and your ceiling may become water damaged. It’s a typical cause of the damp stained ceilings you may encounter. This is often caused by heavy storms and then the damage continues to spread slowly over time. Eventually, this leads to rotting roof timbers. At the very end of the roof, you have your verge tiles, secured within a bed of cement and sand. Water ingress then frosting/thawing can cause damage here. If the bedding is cracked it will begin to flake and crumble away. Verge tiles will need to re-set within fresh bedding. Prevention is the key to longevity for your roof. Check your roof with binoculars often and especially after a stormy patch. You can catch and fix many of these problems before any internal damage is caused. Potential leaks can soon become real damp within your home. At this point it becomes more costly than a simple roof repair. Timber, plastering, interior décor may also need replacing. The cost of replacing roof tiles is far lower than re-plastering and re-finishing your bedroom. If you spot any potential problems you can go and fix it yourself if it can be done safely. Otherwise you can simply call a professional roofer to check it out. Whilst repairing a roof is not always difficult to do yourself, you must always consider whether you need professional help. As always gather a few quotes to ensure your getting the most competitive rate. Detailed below are some useful ballpark figures for roofing work to fall back on. Materials such as replacement roof tiles may be charged on top. How Much to Tile a Roof Completely? This is around the UK average for roof replacements, however prices quickly increased with size and more complicated structures. For a pitched roof tile replacement, mid-terrace with a 55 metres squared roof you can expect to pay around £4000. How much do roof tiles cost? Roof tiles price will vary depending on your material. You won’t require planning permission for repairs or roof replacements. However if you need to make significant structural modifications, such as a loft conversion, consider consulting a member of the Competent Roofer Scheme. They can help reduce headaches and money spent on building inspections and compliance. Get FREE Flat Roof Quotes Today! Get Your FREE Roofing Quotes NOW!